To date, the designs we’ve seen for Thunderbolt 3 eGFX chassis have all been just that – an empty chassis. This lets the user install any GPU they want, but it also means the chassis needs to be sized to accept particularly large video cards. So for Computex Gigabyte’s Aorus division is turning the tables a bit by offering the GTX 1070 Gaming Box: an eGFX adapter that contains a built-in/preinstalled GeForce GTX 1070 video card, allowing them to cut down on the size and complexity of the adapter significantly. While exact dimensions were not available at press time, the GTX 1070 Gaming Box appears to be about half the length and height of the Razer Core and the Alienware Graphics Amp, the current market leaders in this nascent space. Undoubtedly, the Gaming Box benefits from having its card built-in and, because Aorus makes video cards, the company has an edge up on the competition. 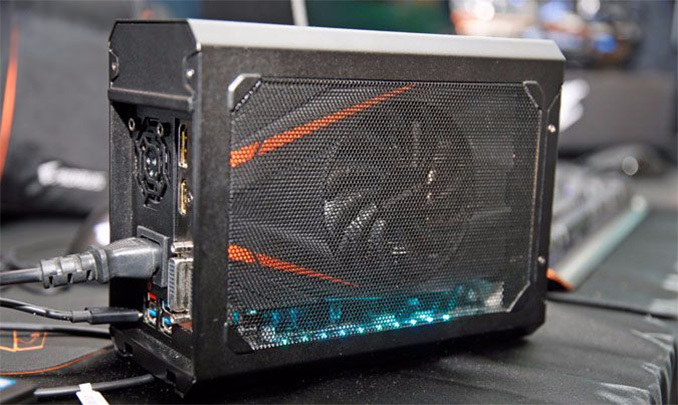 The back of the Aorus GTX 1070 Gaming Box is filled with ports you can use to connect to monitors and other peripherals, including four USB 3.0 ports, two DVI-out connectors, one HDMI out and a single, full-size DisplayPort connection. There's also a Thunderbolt 3 port that you use to connect to your laptop. Notably, the smaller size of the Gaming Box means that unlike any other graphics amp we've seen, the Gaming Box is itself reasonably portable. In fact, it comes with an attractive padded case you can use to take it with you on trips. The integrated nature of the Gaming Box also means that the eGFX adapter is also a bit more reasonably priced. Aorus will be selling the box for $599, a roughly $200 premium over a stand-alone GTX 1070 card. This works out to roughly $100 cheaper than even some of the cheapest eGFX chassis on the market, further bringing down the overall cost of going with an eGFX solution. The Aorus GTX 1070 Gaming Box is due out this summer.